Jellybean 97 (CICMxJB 5) with Prof Jean-Louis Teboul. Professor of Therapeutics and Critical Care Medicine at the University of Paris-South and Editor-in-Chief of Annals of Intensive Care. Jean-Louis is a huge presence in French, European and International Intensive Care research and practice. It is difficult to understate his achievements to date; hundreds of articles, hundreds of chapters and hundreds of lectures delivered at international conferences. Yet when we started talking it becomes clear that the first thing Jean-Louis wants to drive home is not some of his rarified research but some of the most sensible and universally applicable advice for not only the critical care physician but perhaps all clinicians. Individualise Care, conduct a Risk Benefit Ratio Assessment of every intervention and constant Reassessment. Not only does he push us to focus on the individual in medicine but he has a surprising take on Randomised Control Trials (RCT’s), an enduring respect for the appropriate use of the PA Catheter and a refreshing enthusiasm for one of the safest and cheapest investigations; passive leg raising. In 2018 the College of Intensive Care Medicine of Australia and New Zealand held its Annual Scientific Meeting in Hobart, Tasmania. Jean-Louis’s talks from the ASM will all be available on Intensive Care Network and some are up already! The CICM ASM organisers request that we interview the main international speakers but that doesn’t stop us doing what we usually do…. interview anyone with a good story. There will be 5 or 6 “normal” Jellybeans coming from the Hobart ASM. 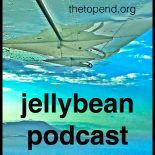 This entry was posted on September 5, 2018 by Dr Doug Lynch @TheTopEnd in CICMxJB, Pure Jellybeans and tagged #FOAMed, CICM, Communication, France, Hoba, Hobart, ICN, ICU, Intensive Care Network, LITFL, Medicine, Passive Leg raise, RCT, Research.